Many people do not really understand exactly what bookkeeping is and how it differs from accounting. By making clear exactly what bookkeeping is, I am able to help my clients understand what is necessary for good financial functioning of their businesses. Bookkeeping is usually performed by a bookkeeper. 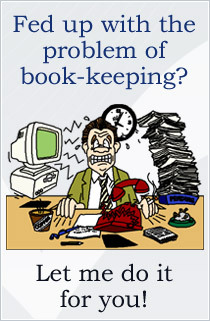 Bookkeeping should not be confused with accounting. The accounting process is usally performed by an accountant. The accountant creates reports from the recorded financial transaction recorded by the bookkeeper and files form with government agencies. There are some common methords of bookkeeping such as the Single-entry bookkeeping system and the Double-entry bookkeeping system. But while these systems may be seen as "real" bookkeeping, any process that involves the recording of fincial transactions is a bookkeeping process. A bookkeeper (or book-keeper), also know as an accountion clerk or accounting technician, is a person who records all the day-to-day financial transactions. Whether it is for a business, charitable organisation or sports/social club. A bookkeeper is usally responsible for writing the "daybooks". The daybooks consist of purchases, sales, receipts, and payments. The bookkeeper is responsible for ensuring all transactions are recorded in the correct day book, suppliers ledger, customer ledger and general ledger. Records what is bought and sold, what is owed and owing, assets that are owned, money coming in and going out and keeps track of what money is held at any time. The bookkeeper brings the books to the trial balance stage. An accountant may prepare the income statment and balance sheet using the trial balance and ledgers prepared by the bookkeeper. Most people have systems for individual and personal bookkeeping - keeping track of bank accounts, credit cards, income and expenditure, etc. There are no rules about how this should be done, but where other people’s money is involved, there are strict legal requirements. In the past bookkeeping was done with pen and paper and this is still used for some simple records. However, with increasing complexity of such things as tax assessment and to minimise calculation errors, most bookkeeping today is computerised. There are dedicated software programmes for computerised bookkeeping (such as Sage) and programmes such as Excel which allow manual bookkeeping to be done on a computer. There are two common methods used. ‘Single entry’ is used for basic income/expenditure accounts; each transaction is recorded once. The primary bookkeeping record in single-entry bookkeeping is the cash book, whick is similar to a checking (cheque) account register but allocates the income and expenses to various income and expense accounts. Separate account records are maintained for petty cash, accounts payable and receivable, and other relevant transaction s such as inventory and travel expenses. These days, single entry bookkeeping can be done with DIY bookkeeping software to speed up manual calculations. ‘Double entry’ is used where more than simple income and expense transactions are recorded and involves posting (or recording) each transaction twice. What should you look for in a bookkeeper? A bookkeeper is a vital part of the jigsaw in managing the financial aspects of your business and ensuring compliance with legislation. Are they qualified - having formal qualifications shows commitment and dedication to the profession. Are they experienced - sometimes qualifications are not overly important but no qualifications and no relevant experience is not a good mix. What software packages do they support? Are they currently up to date with business legislation? Allum Book-keeping Services is based in Weymouth covering Weymouth, Dorchester, Portland and the surrounding areas and provides a professional, cost effective service. I am able to take away from business owners the time and worry spent on bookkeeping that is not usually their field of expertise. This enables them to concentrated all their efforts on running the business which they do understand. Properly kept and presented books are often a useful tool in developing your business. My aim is to allow the business owners to focus on developing and growing their business with the reassurance that an expert is looking after their books. Not only can you rest assured that your books are being kept to a high standard, I can also advise on improved, more efficient systems and will ensure that when the books are passed to your accountant, there will be little for them to do, as they will have less errors and more accurate reports. If you have any enquiries or would like further information on the services provided, please feel free to contact me. Some of our most popular services are; Bookkeeper Dorset, VAT Dorchester, Payroll and self assessment.